The next significant holiday that is said to be related to the mushroom is Easter. The only link I found was that the shape of the mushroom at this stage mimics the shape of the cross. The cross is then used as a camouflaged symbol. Theres also the original christian tradition to paint eggs red for the occasion and this color was specifically chosen to represent the blood of Christ. It's a little spooky, unless it was a representation of the mushroom (more on that in the next post). I never realized that Easter, the actual day, is selected based on astrology: It's always fall on the first Sunday after a full moon. It seems a bit odd considering the fact that I've always been told that astrology is opposite of Christian beliefs, but it is what it is. I also found out that the custom of decorating eggs during that time of the year dates back from the time of ancient Sumerians and Egyptians. 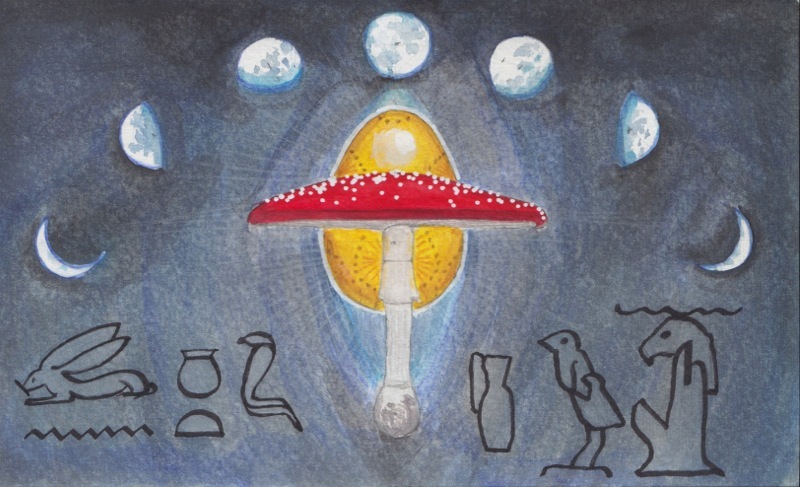 Celebration of Shemu (now called Sham el-Nessim, a day following Easter Sunday) is the season of harvest and rebirth, where people would write their wishes on painted eggs and put them on windows and trees to receive the blessings of the first rays of the morning light produced by sun god Ra. Fascinating!